It’s 80 kilometres from the main street of Longreach to Hugh Button’s farmstead: an hour of bare, parched brown earth whipping past the windows of his four-wheel-drive; an hour of nothing but the occasional dead eucalypt or roadkill kangaroo carcass dotting the dead-flat Martian landscape of central Queensland. “We consider this living in the suburbs,” he grins. Longreach is about as close to the centre of Queensland as it’s possible to get. Around 1200km northwest of Brisbane, 800km southwest of Townsville, the country is wide and carved into chunks by the Thomson River, whose offshoot creeks and streams snake across the plains. It is good land for sheep and cattle farming -- but the river lies nearly empty. It hasn’t rained for close on four years. "There are good times out here, but the good times aren't good enough anymore. The grass should be knee high and you shouldn’t be able to see the ground through it,” Hugh says, gesturing to the dead dust. A few tufts of crunchy spinifex grass are all that break the red monotony. An empty ditch runs alongside the road -- in a normal year, you’d call that the Thomson, and its banks would be overflowing. A recent explosion in the local kangaroo population has seen the boomers eat almost every skerrick of vegetation, leaving not even wild grass for stock to graze on. “It's like steel wool now. Usually it floods here every year. See those out there?” he points to a few gnarled trees speckled black and white, their bark almost totally ripped off. “The kangaroos eat the bark off, they're so desperate for a feed." We arrive at the Buttons’ property, Crossmoor. A handful of thin cattle graze at the front gate, scrimping for scraps of grass. As recently as January, the Buttons ran 2000 cattle, and have raised up to 5000 in a good year. These eight beasts are the last they have left, having made the heart breaking decision to sell their whole stock recently. "We had a small window where they would look good, they would be fat. We sold, banked the money, put it back into our land,” Hugh said. Longreach has become the unofficial poster child for the drought choking the country. Three summers have come and gone since substantial rain last wet the ground here. Since May, 33.6mm rain has fallen in the region. Two-thirds of that came in a two-day spell in June. It has been a long, hard stretch razing not only the farming trade but every associated industry for hundreds of kilometres around. Cattle yards have long-since closed. Shearing sheds and the shearers who filled them are gone too. Trucking yards lay locked up, big rigs dusty in the lot. In town, grocers and newsagents and tradesmen and retailers are suffering. Bill Ringrose, treasurer of the Western Queensland Drought Committee and president of the Longreach State Primary School parents and citizen’s association, tells us revenues in town businesses have plummeted up to 80 percent in the last year, while the school has shrunk from 338 pupils in 2012 to 220 today. Many children are sent away to boarding school -- their parents are telling them to stay in the city, because there’s nothing for them in the bush anymore. The streets in Longreach are all named after birds; Finch Lane, Falcon Street, Parrot Lane, Eagle Street. But unlike the avian counterparts their roads are titled for, Longreach residents can’t fly south for the winter. They can’t pick up and migrate in search of better climates. Some have tried, but a local real estate agent says housing prices have dropped 20 percent in the last year and many properties lay empty. One agent alone has 81 properties for sale. But we arrive in Longreach on the cusp of arguably the most exciting and anticipated weekend in years. Aussie troubadours Paul Kelly and Troy Cassar-Daley are here to perform a huge outdoor concert at the historic Stockman’s Hall of Fame, the town’s biggest tourist attraction, ahead of the annual Longreach Cup race meet which marks 125 years of racing in the area. “It’s much different to a city race. I could go and not care if i don't see a horse all day. It's a day out for people, especially in far flung communities,” Hugh says. We’re on the verandah of the beautiful long, low-slung Federation homestead at Crossmoor with his partner Amanda and mother Penny. At 31, Hugh is blonde and brown and broad. He’s got a strong handshake. Out here, they've all got strong handshakes. “It's once or twice a year that people will go out. It's a great way in times like this, mingling with someone you’ve got a common interest in,” he says. Penny, a veteran of 67 years on the land, gives us the unofficial ethos of the dry season. “They say in a drought, you need to stock the larder, stock the bar, have a holiday, get yourself right and don't let it get you down,” she said. Rosemary Champion, who owns the Longway cattle station on the outskirts of town, has a different motto. “You need a dog in a drought,” she says. It’s early morning and we’re in the cab of her flatbed truck as she and husband Warwick hand-feed hay to their stock of 150 Santa Gertrudis cattle. Her little dog, Boots, sits proudly in the passenger seat, looking down on the maroon cattle. The Champions have had to scale back their operations as well, shrinking their stock from a height of 2000 cows. The couple have lived at Longway, a century-old property, for 40 years. “All our family in the city are doctors and stockbrokers who spend their lives travelling overseas and they think we’re crazy. But we couldn't imagine doing what they do either,” Rosemary says over the roar of the truck’s engine. Warwick is on the back, hurling bales of hay for their livelihood to feed on. “You wouldn't do it unless you enjoyed doing what you're doing. In spite of how bad it is, I still love it,” he says. Rosemary’s father Sir James Walker was mayor of Longreach for 35 years. He hosted Queen Elizabeth and the Duke of Edinburgh at Longway in 1970. Pictures of the royal visit adorn the walls of the house. The 16,000-acre property costs $130,000 a year in upkeep. They’ve had to sell most of their machinery just to keep up with bills. 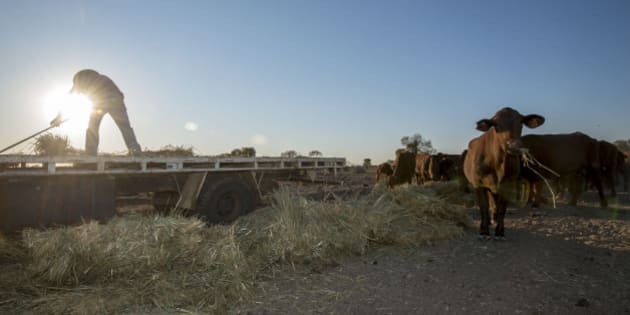 Finances were made all the harder in the wake of the 2011 live export ban, where Rosemary says they “begged” buyers to take their cattle at 95 cents a kilogram. Today, prices are around $3 a kilo, but the the aftershocks of the ban are still pulsing around cattle country as the market settles back into equilibrium. “You can talk about business and finance, but you have to walk the walk. You have to live this every day. Financial advisors and bankers, they're great to walk ideas by, but they don’t know what it means to live here and to do it 24/7,” Rosemary says. The entire town, it seems, has turned out for the concert on the grounds of “the Stockman’s.” Opened in 1988, on another visit from Queen Elizabeth, the timber and stone and iron building today plays host to other esteemed guests. Paul Kelly and Troy Cassar-Daley perform on a pop-up stage in front of the hall, a sea of camp chairs and picnic blankets laid out in front of them as locals settle in for a rare night of live music. Families of mums and dads with kids on their shoulders, young people in checked shirts and RM Williams boots, older couples in their best jeans and wide Akubra hats -- they all mill together in the shadow of the Hall of Fame, tonight bathed in blue light. It’s almost a visual plea for water and satiation. Kelly and Cassar-Daley have donated their time. All the money raised is going to the Western Queensland Drought Appeal. Penny made it into town for the concert. Hugh and Amanda stayed behind at their farm. Rosemary and Warwick did too, ahead of a pre-dawn wake up to feed their cows. They had to choose between attending the concert on Friday or going to the races on Saturday. They chose the races. “It's important these things are on, because it's so easy for people to sit at home and get into a mindset where they get upset. These weekends are wonderful to keep spirits up. just to get away from the bleakness of what they're going through,” Ringrose said. As treasurer of the drought committee, he keeps watch over how the dry is affecting the town, the country and everything in between. “We’re trying to attract people here on these big weekends, to come and spend here; things like asking people to put off their car service until they hit town to spend it here. The awareness is the big thing. If we can get people to keep coming to spend money here it will help us get through,” he said. It’s Saturday morning and most of the town is still abuzz from the concert overnight. Brodie Jackson, at Valerie’s Flowers and Arts in the main street, said a big weekend like this could be the difference between a lean or comfortable season ahead. “We haven't had much of a tourist season, no boom to get us through to Christmas yet. The locals are happy to support local business, they're just spending less money,” she says. In everything from Sunday best and elaborate fascinators to singlets and thongs,the race meet begins. It's a horse race, but it's more. It’s a chance to let your hair down. It's a time to mingle and have a drink with a friend you might see twice a year. It's a party. It's much more than a punt for these people. It's a rare occasion where the town gathers for fun. For farmers who sweat and toil and scratch a living from the barren brown earth, it's a time to relax and forget about the fence that needs mending or the cows that need fattening or the kangaroos chewing the garden. Little boys wander past in Akubras with brims wider than their shoulders. Kids stuck on far-flung properties get a chance to meet new friends; so do their parents. It's a 200-kilometre round trip to the pub for some of these people, so they make the most of chances to socialise. Whole families lob up together; there aren’t exactly a lot of baby-sitters in town. The race course is a rare oasis in the desert. Grass, however patchy, grows here. There's beautiful old trees with precious shade-giving leaves -- the first such I've seen since Brisbane. The concourse is carpeted in green, but the track is a barren dust bowl. Huge brown clouds are kicked up by horses galloping. Rob Luck, president of the Longreach Jockey Club, is buzzing with excitement when we catch him just moments before the main race of the day. The 1200-plus crowd at the Longreach Cup, the 125th anniversary of racing in the region, is the biggest in 20 years. “In a severe drought situation, days like this means so much. They create a cash flow in town, they bring a massive number of people in, but one of the most important things is the ability to get away and forget about the drought for an afternoon and mix with friends they might not have been able to see for a while,” Luck said. There’s a question we’ve asked every person we’ve met in town; what has to change for things to get better? The answer, unsurprisingly, is out of their control -- but so simple. “We're at rock bottom. We can't do anything until it rains,” Hugh says on his front verandah. Penny says the people of the bush have been forgotten by governments for years. “We’ve been bled dry for the last 100 years because there's no votes out here. The last development I can think of was 50 years ago. Floods and bushfires get attention because they’re instant. Drought is more like a strangling,” she said. On Longway, Warwick says politicians have no concept of how farmers are faring. “We’re voices in the wilderness. We’ve got some good representatives, but without a majority of politicians having a connection with the rural sector, they can just brush aside because we haven’t got the numbers,” he said. With a recent change in prime minister, many in Longreach are optimistic. They say -- or at least hope -- Malcolm Turnbull may be more receptive to rural issues than Tony Abbott. They want to make their case in person. “What would make a difference is some recognition from the government. From that, everything would flow on. I’d like Turnbull to come up here, with not one bit of media, but just let him drive around and look,” Penny said. Friday night’s concert ends with Paul Kelly and Troy Cassar-Daley together on stage, singing Kelly’s iconic tune ‘From Little Things Big Things Grow’. It is the ballad of the famous walk-off of indigenous Gurindji workers from the Wave Hill station, but it has been elevated to an unofficial anthem for the country, giving a voice to the rural voiceless.